WHEN he steps on to the platform to face shareholders at the Edinburgh International Conference Centre this week, Antonio Horta-Osorio may be excused a wry smile. Just over two years ago, and just eight months into the job, the chief executive of Lloyds Banking Group was forced to take leave of absence, suffering from stress and exhaustion. Analysts and investors alike believed it was impossible for the suave Portuguese to return to the job of tackling one of the biggest turnaround jobs in Europe. But after a ten-week break he resumed his role and threw himself once more into the heat of the banking battle, not least to win back the support of waverers who had backed his move from the UK operation of Spanish bank Santander. Not only did he return, but he can boast of a string of successes that proved wrong those who would have discarded him as a beaten man. On Thursday he will tell investors that Lloyds is back in profit, its balance sheet has been rebuilt and the bank is ready to resume paying dividends for the first time since 2008. Added to that, the shares are now above the price paid by the taxpayer, enabling the government to sell down its stake, and assets have been sold, or are ready and waiting to be sold, as instructed by the regulators. So is it a case of all boxes ticked and job done? Gary Greenwood, an analyst at Shore Capital, says the chief executive will be able to deliver a confident message in terms of the bank’s prospects, but believes there are still challenges ahead. “They have addressed a lot of legacy issues, but I think there’s still a lot they can do in terms of cutting costs. And they have growth in the core lending business,” he adds. He says the chief executive will likely be asked what role technology can play in cutting costs, given how Barclays is using online systems to reduce its branch network. “Lloyds has been a lot more defensive in terms of cutting back on the branch network than its peers,” he says. But he thinks management will be intent on bringing down its cost-to-income ratio by almost ten percentage points in the coming years. When news of the chief executive’s enforced absence was announced in November 2011 it shook the markets, sending Lloyds’ share price plunging below 25p and leading to speculation that a replacement was being lined up. He returned to present annual results in February 2012 but had to reveal a £3.5 billion loss which made assurances about the improving nature of the underlying business seem optimistic, especially as the firm’s own forecast for the year ahead was bearish. Its loss, against a £281 million profit in 2010, was mainly triggered by a £3.2bn provision taken in 2011 to compensate customers for the mis-selling of payment protection insurance (PPI), and some continued restructuring costs. These were the responsibility of the previous management but analysts joked that PPI provision should no longer be classed as an exceptional item by UK banks, as every year further provision had to be made. Lloyds’ linchpin UK retail business, which includes Bank of Scotland and Halifax, saw profits dip 9 per cent to £3.6bn, partly hit by historically low interest rates. A three-year freeze on payouts to investors by the European Commission had expired a month before, but the bank warned it was in no shape to resume dividends. 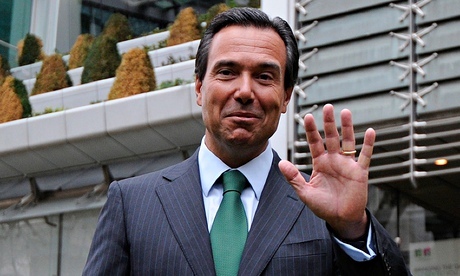 At his second AGM, Horta-Osorio warned that Lloyds was only a year into a three to five-year journey towards a point where the taxpayer might be able to recover in full the £20bn pumped in after the bank rescued rival HBOS, with disastrous effects on its own balance sheet. He was expecting little help from the stagnating economy, but at least the sale of 632 branches to the Co-op appeared to be going well, allowing Lloyds to draw a line under another contentious issue, even if it had to part with a significant chunk of its business for a paltry £750m. That was not to be, however, and the Co-op deal proved a long-term headache for the Lloyds boss as it unravelled over the course of the year. That too, however, has more recently been turned into a victory for the bank’s management, who revived the old TSB brand and formed the branches into a standalone business. The group said this month that it would list the TSB business on the stock market within eight weeks, tapping into the current flotation fever by selling a minimum of 25 per cent of the shares straight away in a move that will include an offer to private investors. In total TSB is likely to net Lloyds about £1.5bn, twice the price it was due to get from the Co-op. Other divestments have also proved reasonably profitable, even if the main purpose was to slim down and simplify the company. It offloaded its majority holding in wealth manager St James’s Place in three tranches last year at prices of 510p, 580p and 630p. Even if the share price has since climbed higher, the final sale alone netted around £670m and allowed Lloyds to book a profit as well as providing further funds to raise its capital holdings – a key metric in its quest to be allowed to resume dividend payments. The bank further simplified its structure by divesting Scottish Widows fund management business Swip in a £550m deal with Aberdeen Asset Management – with many commentators suggesting that Lloyds got the better half of the deal. Lloyds’ share price has already soared well above the 61p registered in the government accounts for the taxpayer to break even on the bailout, which also takes into account money paid by Lloyds to the government in fees. This has allowed UK Financial Investments to reduce its stake from 41 per cent to 25 per cent with the scale of two tranches of shares to large institutions. Restarting shareholder payouts is seen as crucial if the government is to sell any of its remaining stake in the bank to small investors – a move which may prove more popular. Finance director George Culmer is scheduled to hold talks with the Prudential Regulation Authority later this year on restoring the dividend, and has voiced his confidence that the group’s balance sheet will be strong enough to resume payouts next May. The restoration of a healthy dividend would do much to win over the long-suffering small shareholders, many of whom bought into Lloyds at a price many times higher than the current valuation and have seen no income from their investment since the disastrous takeover of HBOS in 2008. However, the analyst community may prove harder to win over, as many believe the current share price values the firm at around 50 per cent more than the sum of its assets. Sandy Chen, at Cenkos Securities, said that although management is doing a good job, he doesn’t think the prospective profitability justifies Lloyds’ current valuation on the stock market. And he notes that during the quarterly results presentation, management repeatedly flagged “several hundred millions” in one-off charges for long-term service contracts that would be crystallised on a TSB flotation. He said management is being “understandably coy in setting a dividend target – particularly in light of the pricing uncertainties around the TSB disposal”. But Greenwood says the premium over its asset value is “more than justifiable” as the bank is a good play on the recovering UK economy, with a relatively low-risk profile given its focus on retail and commercial banking.